Over the years Rodney has watched his son Clark develop his skills in the residential and commercial security business. 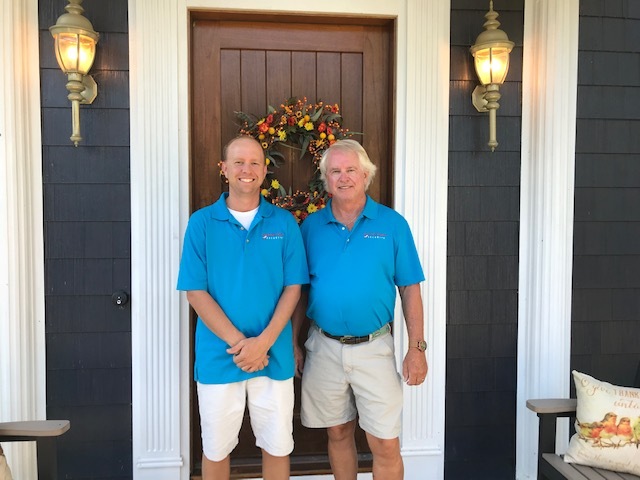 When Clark hit the 10 year mark in experience, they decided to open their our own security company here on the Outer Banks of North Carolina. That was in 2013; it took over a year to get all the necessary licenses and state approvals to get into the security business. 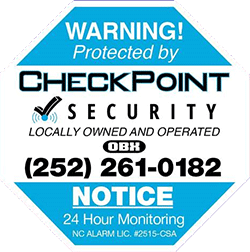 Clark got his electrical license in the winter of 2014 and they were approved by the NC Alarm Systems Licensing Board in August 2014, so now they are legally operating as CheckPoint Security. They believe in having the right tools to do a professional and efficient installation. We hope to see you soon… Watch for our van and trailer up and down the beach and in Currituck County; you can’t miss us!They have made a substantial investment in a van, outfitting the van, and a 6×12 cargo trailer. They have purchased all the necessary tools and start-up materials for the security business. CheckPoint also has a $1 million general liability policy and Workman’s Compensation insurance. They pride themselves in meeting with their customers to see exactly what their needs are and customizing the job to their expectations. It is their sincere hope to bring security to the next level on the Outer Banks. Rodney started his career in banking right after graduating from East Carolina University with a business degree. He did mostly corporate banking for 25 years with some commercial banking. He stayed with banking long enough to pay the bills and get his kids up and established on their own. After that he switched into real estate full time buying fixer uppers and distressed properties. The properties were remodeled and put into a personal rental program that he still owns and operates. This lead him to get his general contractors license which is still active and he has done several start up restaurants on the Outer Banks along with the remodeled rental properties. Clark, his son and partner in CheckPoint, had been working for a local security company here on the Outer Banks for about 10 years when he approached Rodney and said he would really like to have his own company. Clark had reached a point where he wanted to be able to think out of the box and approach the security business in a different mindset. To embrace all the new technology with an eye towards sharing it with his clients; buying and using modern installation tools and techniques. So, Rodney said he was in if Clark passed all the required exams to get a NC alarm license. Clark studied one whole winter, passed the exams, and called his dad to get his checkbook out. Years later, we have no regrets and love having our own business together. We enjoy working with and getting to know our clients with their concerns and working to an agreed solution. When not helping Clark or repairing rental properties, Rodney loves to surf fish here on the Outer Banks. He also owns a Carolina Skiff which we frequently use for speckle trout fishing in the sounds and fresh water fly fishing in the local rivers and lakes in eastern NC. He and his wife have lived on the Outer Banks for 21 years. Clark and Rodney have a mutual respect for all their clients. They have one solid business principle of striving to not have one single unsatisfied client that they work with. Clark has over ten years experience in the electronic security industry. During this time he was a lead installer for a very reputable alarm company where he gained valuable skills in the installation and design of electronic security systems, closed circuit camera systems, and commercial fire alarm panels. Clark is a licensed electrical contractor for the state of North Carolina. He has worked in some of the largest homes on the Outer Banks from Carova to Cape Hatteras. Clark knows the complex construction of these homes and has the tools and resources to do the job right. Whether you own a home or business, Clark has a comprehensive knowledge in the design and installation of life safety and surveillance video systems. He will custom design a system that fits your budget and your needs and simplify the process for end users.